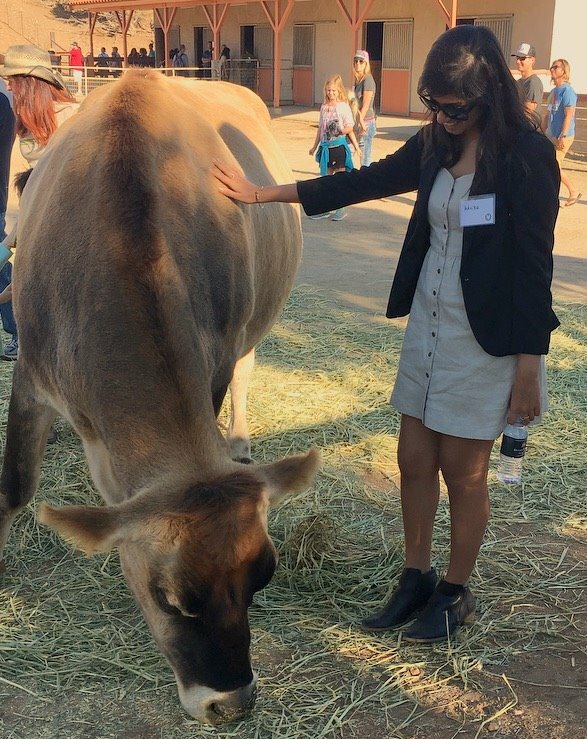 At Farm Sanctuary‘s 30th Anniversary Celebration, I was star-struck. A gala in Los Angeles? You’re probably thinking it was Natalie Portman or Kat Von D or Emily Deschanel or one of the other big names that had me gaping. Think again! It was that turkey, who despite his legs bandaged up, still hobbled excitedly towards the Thanksgiving pie. It was that pig, who pumped with steroids to become twice it’s normal size, lay back in the shade enjoying his belly rub. It was that baby lamb, frolicking up a little hill, while his mother limped behind him. How much that baby had overcome, while his mother knew only pain and suffering. How could I possibly eat that little baby? Advika Gupta has a bachelor’s degree in Psychology from Stanford University and is currently the Director of India Operations at Wyz Kid Labs. A passion for creative writing, combined with a deep understanding of human psyche, has molded her life. But veganism isn’t the only cause she believes in. Having founded the Stanford Association For Empowerment, a campus-wide initiative to facilitate trauma healing, she is now expanding her scope to help students from around the world who are facing mental health issues. A published author, Advika spends her free time painting, hiking, traveling the world, and experimenting with ingredients in the kitchen.